Implant supported dentures are dentures fixed in place by at least four dental implants (per arch). The number of dental implants this is necessary or ideal for supporting a denture can vary based on your unique oral needs, jawbone structure, goals, priorities, and budget. 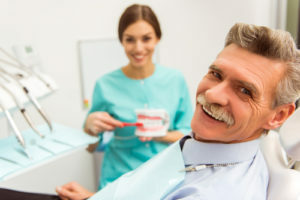 To evaluate your candidacy for implant dentures and develop a personalized treatment plan, Dr. John Cross performs a comprehensive exam using state-of-the-art imaging technology. Based on his findings, along with a discussion of your concerns and desired outcome, he can suggest an approach that is custom-tailored for you. 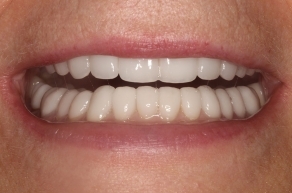 One of the most popular and widely publicized implant denture techniques is called the All-On-4® method, which uses four strategically placed dental implants (two in the back and two toward the front of the mouth, per arch) to hold a custom denture firmly in place. 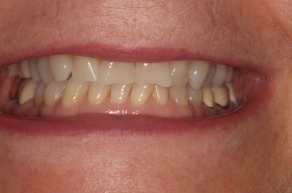 All-On-4 is often a very desirable option for patients with diminished jawbone density/volume who seek the security and natural-looking results implant dentures can provide. 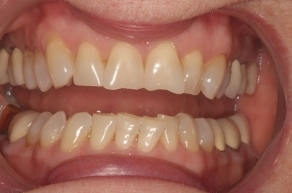 Full-arch dentures can also be supported with six (All-On-6) or as many as eight dental implants for patients who are good candidates. The additional dental implants can deliver enhanced support and reliability, while also helping to stimulate more of the jawbone tissue to prevent bone loss. If you are considering implant dentures and want to find out which method may be best for your needs, please contact OC Lifesmiles to schedule a consultation with Dr. Cross. 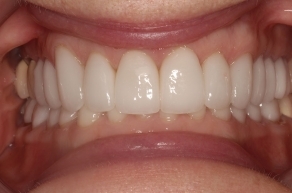 « What Are My Tooth Replacement Options?